In this blog, I’ll discuss how to create custom dictionaries in SAP HANA. To implement certain custom use cases, customers have to implement their own dictionaries for performing Text Analysis. Use Case: A company has ‘n’ number of products in product portfolio which are not covered completely by standard configuration. In such case, they can create a custom dictionary with an entity category Product and add all the products names in the portfolio. SAP HANA is shipped with several predefined, standard text analysis configurations. Such configurations are available in “sap.hana.ta.config” repository package as shown in Figure 1. For more details on standard Text Analysis Configurations, refer to the blog [ https://blogs.sap.com/2018/02/01/sap-hana-text-analysis-3/ ]. Dictionary contains a number of user-defined entity types, each of which further contain any number of entities of standard and variant types. In simple terms, dictionary stores name variations in a structured manner to be accessible through the extraction process. Dictionaries are language-independent, and can be created for all 34 supported languages. Figure 2 below shows the custom dictionary created for performing Custom Text Analysis. 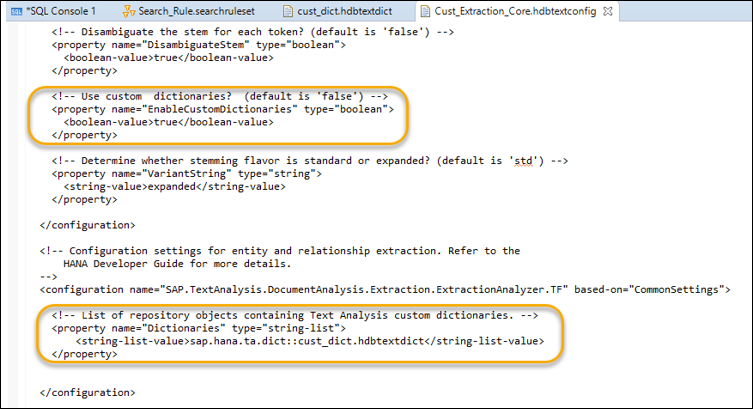 Custom Text Analysis Configurations can be used to perform custom text analysis using custom text analysis dictionaries and extraction rule set. Create your own custom text analysis configuration files with “.hdbtextconfig” file extension. Configuration files are also in XML format. Below is a Piece of Code that shows the sequence of Text Analysis Steps in XML Format. 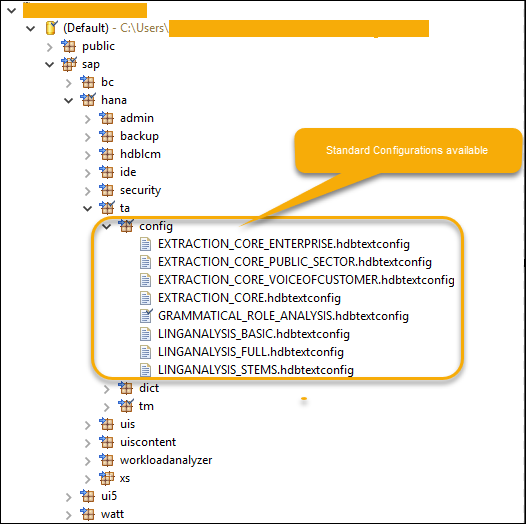 In our example, custom text analysis configuration is managed within SAP HANA repository. Figure 3 below shows the property sections highlighted with enabled the custom dictionaries, and inclusion of custom dictionary path. 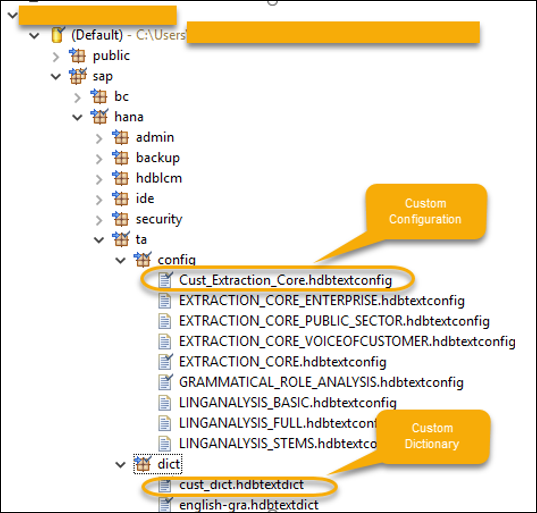 Dictionary is created in “sap.hana.ta.dict” repository package and Text Analysis configuration is created in “sap.hana.ta.config” repository package as seen in Figure 4 below. This custom form is used to extract basic entities from the text and entities of interest including people, places, firms, URLs, and other common terms. Figure 5 below shows the rule as Entity Extraction in TA_RULE column with new category names and available basic entities. In summary, we covered detailed steps on how to create and implement custom dictionaries in SAP HANA for performing Text Analysis in certain custom use cases. I hope that this is the right place for my comment. The first configuration option “EnableCustomDictionaries” shown in the Fig. #3, that is part of LinguisticAnalyzer’s section is not related to the subject of this blog entry. Users can create customized additions to such linguistic analysis steps as stemming, determining part of speech, finding multi word tokens and abbreviations by putting them in relevant files with suffix “-cd” (for example “english-std.multiword-cd”. It is meant for rather advanced tinkering and I’m not even sure at this moment how it can be accomplished in HANA. Setting “EnableCustomDictionaries” to “true” or “false” tells Linguistic Analyzer whether to use those files, but is will not affect custom entity extraction, which is the topic discussed here. Seeing it mentioned in this context I realize now that the name for that option can be confusing, unfortunately. It is the other option, “Dictionaries” that you need to use. That one is part of Extraction Analyzer’s configuration. I have updated the comment in the screenshot. Option is available for enabling the custom dictionaries. In this case, example of extraction analyzer is considered for explaining the topic. Thanks for your blogs. It’s helping me a lot in my journey with HANA database. I’m trying to create custom dictionaries for text analysis in my Hana-db instance, just like you created on this blog, but I’m using Hana services in Cloud Foundry environment on SAP Cloud Platform and I don’t know to do deploy my created custom dictionary. Do you have any idea in how can I do that via Hana database explorer?